When the highway between Dubai and Sharjah was expanded in the 1980s, the Japanese town planner in charge designed it to be a 12 laned one; 6 lanes each on either side. He was mocked and ridiculed at that time as it was perceived as a colossal wastage of public penny. 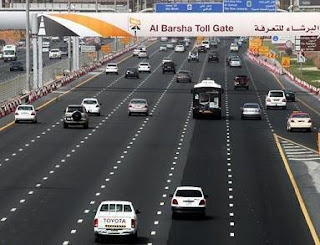 Now, when the traffic along the highway has surpassed even the wildest imaginations, choking all the 12 lanes, the residents bow to the astounding foresight of the foreign architect who predicted this scenario over 25 years ago. We've had such visionaries in Kerala too, when it came to the designing of public infrastructure, the likes of Sri. Panampally Govinda Menon and the Travancore Royal family. 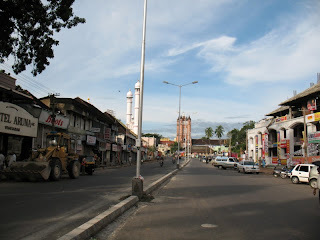 When Panampally built the MG Road in Cochin he was lampooned over his decision to provide the road a width of 21 m(70 ft). The road was initially known as the 70 feet road as the populace saw it as an extravagance. But Mr. Menon had the vision of a great leader that even this road would become inadequate in future, and how right he was! 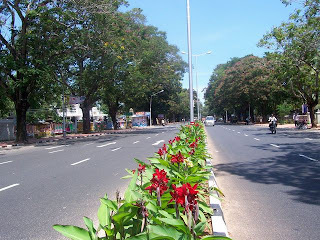 Same is the case with the Kowdiar Avenue in Trivandrum built by the Travancore Kingdom, which still remains the stand-out road in the state. The 60 years of Democratic regime constructed some so-called highways which pales in comparison with the 'rajaveedhi'. Sadly the avenues above remain the only instances where the planners have shown some prudence while designing the roads. The standards adopted by Kerala in building roads regularly fall woefully short of basics. For us the customary width for any road is 2 lanes, roughly 10-12 m. A 4 laned road seems to be the superior level, and 6 lanes a profusion! That's the Kerala model of development..reverse technique. By the time they 'plan' to develop this road to 'international' standards( meaning 4 lanes), the land development would be completed, land values would've shot up in geometrical proportions, there would be court cases, survey & marking procedures (using the techniques invented by Egyptians for their Pyramids), eternal relaying of cables and posts by KSEB, protests, action forces and whatever you could think of. End result: The road never gets widened. Just for kicks: The Govt is still 'developing' the 3 km long Sahodaran Ayyapan Road in Cochin, which commenced in 1996. Acquisition of land is the biggest headache for planners when it comes to road development. The density of population, continuous urban stretches, astronomical property prices all create incessant turbulence to acquisition. The authorities fail to encounter this problem over and over again by repeating the same mistakes. 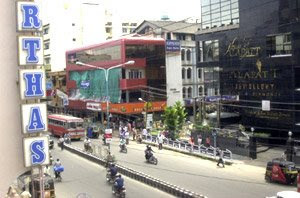 The Trivandrum Road Development works present another example. 42 km of roads in the capital is being widened and new corridors created. The plan appears good but again falls worryingly short of basic standards. The widest road is the MG Road, planned to accommodate 6 lane traffic at 28m edge-to-edge. This includes 2.5m wide footpath on either sides and a road divider, which essentially shortens the carriageway to 24m. Appears all right, but considering that this will be the arterial avenue and one lane each would be sacrificed for parking, even this road seems inadequate. Another link to the Bypass, the Ulloor-Akkulam Road is expanded to 16 m...I'm not sure about the width this road will have along the International Convention Centre premises, but given the 'sense' of our planners I see no more than an ordinary 4 lane carriageway through this future artery for Trivandrum. The Trivandrum Bypass, slated for expansion, seems to adopt some of the necessary standards, thankfully. It is understood that the architecture for the Bypass encompasses service and emergency lanes on both sides, a 10 lane toll plaza and exclusive service roads when the development is complete. On second thoughts, developing it into a 6-8 laner right away would alleviate many miseries in the future. A transhipment port, international tourist destination, an Int'l Airport, huge Railhead, India's largest Technopark, various Industrial Parks and a gigantic Technocity are all lined up along the 30+ km from Kovalam to Pallipuram! Not to mention the countless residential & commercial developments. Its a shame that the authorities can't think beyond this 16m and 20 m wide 4 lane roads. We must learn from the scenario in Bangalore, like in Airport Road and Hosur Road which has a carriageway of nothing more than 15m (footpaths on either sides make it approximately 28m). 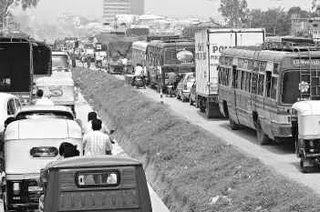 Hosur Road has service lanes in patches, but too inadequate for a city aspiring to be a global metropolis...Chennai has double the vehicular population of Bangalore but isn't as congested as the latter, as it harbours wider roads. Planners of Hyderabad needs a pat on the back as they seem to have set a basic standard of 24-32m for all new major roads under development. So where does it leave Trivandrum? There are people arguing that the width is more than enough for Kerala cities as it is mostly occupied by mopeds, bikes and rickshaws. 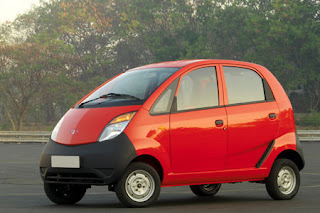 Well, they must've heard the TATA Motors' plan to replace them all with their Nano...If the scenario is bleak now, it will be a total disaster tomorrow! Expanding the roads are not the only solution to the apparent eternal gridlock we are going to face in the future. Rejuvenating the screwed up Expressway project and constructing new channels for specific traffic is radical to the citizens of Kerala. Will continue here in Part II.